anybody know anything about this fork? Looks like an old late-60s/early-70s Schwinn Krate springer fork to me. Maybe, the Schwinn springer fork came in at least two lengths. One was basically for a 20" wheeled Stingray. It was used on the Krates too. I think the difference on the Krate fork was a provision for a hub brake plate rotation limit bolt pin, that bolted through the LH blade or strut as I recall. Could not afford a Krate, so I bought a "mini wheel" and a Varsity fork and made my own… Krate like bike. Others in the neighborhood followed suit. Old or repro, those things are widely available on eBay. It looks a lot like one of these, which is what you don't want. Do people actually ride these things? 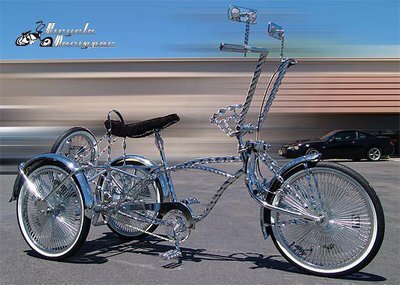 I could see cruising a lowrider drive in but that is about it.